A large, backlit graphic LCD displays easy to read values, including real time force, peak force, programmable pass/fail limits, units of measurement and more. Data can be transferred to a PC or other data collector via USB, RS-232, Mitutoyo or analog outputs. An analog load bar is shown on the display for graphical representation of applied force. On board data storage for up to 1,000 readings is included, as are statistical calculations and output to a PC. Unique automatic output / data storage / zeroing upon sample break helps automate testing pprocesses. An optional ring terminal fixture may be used to secure ring terminations and an optional carrying case makes transportation simple and safe. Outputs: USB / RS-232: Configurable up to 115,200 baud. .
Analog: ±1 VDC, ±0.25% of full scale at capacity. * Including insulation. 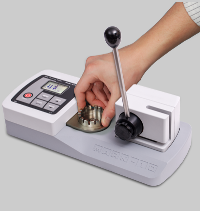 To ensure the wire sample will fit into the WT3-201, measure the overall outside diameter of the insulated wire and check against the specified diameter range. Account for sample compressibility in making this determination.